Create With Me: Hello Circles! Today I'm playing along with the Freshly Made Sketch Challenge. I started my card by sponging 3 colors of Distress Ink over a panel of watercolor paper - Salty Ocean, Spiced Marmalade and Candied Apple. Then I laid a handmade circles stencil over the panel and wiped over the circles with a slightly damp baby wipe to remove the ink. Sort of like the look of Bokeh?! I white embossed the hello sentiment on a black strip and layered it over the panel with foam dots.. 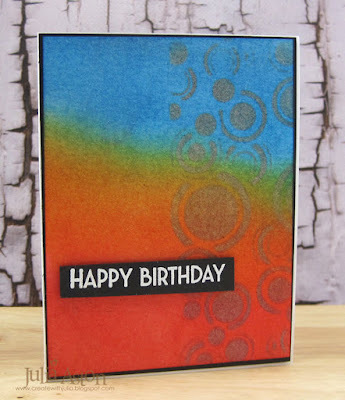 While I had out all the supplies for this card, I decided to make another one using the same colors but this time using a Retro Circles Stencil from ARTplorations. I sponged over the stencil this time - using Hickory Smoke Distress Ink. 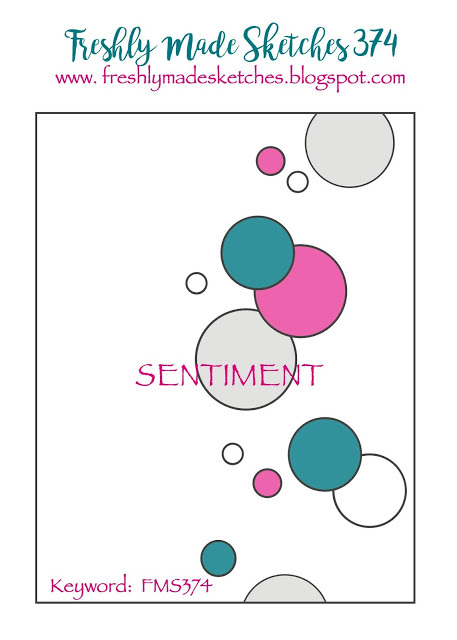 I white embossed the sentiment on a black strip and popped it up on foam dots. I like how the Spiced Marmalade Distress ink blended with both the blue and red inks to create some green and yellow shades in the middle! I hope these are considered a clean enough design for the challenge even though they are covered with color. Paper: White, True Black - PTI, Watercolor paper - Canson. Ink: Versamark, Ranger Distress Candied Apple, Spiced Marmalade, Salty Ocean, Hickory Smoke. Accessories: Wow Bright White Embossing Powder, form dots, Retro Circles Stencil - ARTplorations, baby wipe, handmade circles stencil (acetate and circle punch). Beautiful blended, warm shades, Julia! Love the Bokeh look! 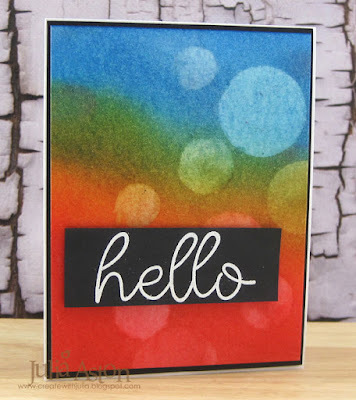 Two beautiful cards - love the variation you got from using two different stencils. What gorgeous cards! I just love that background! Such rich colours! The dots definitely look bokeh! Thanks for joining us this week at Freshly Made Sketches! 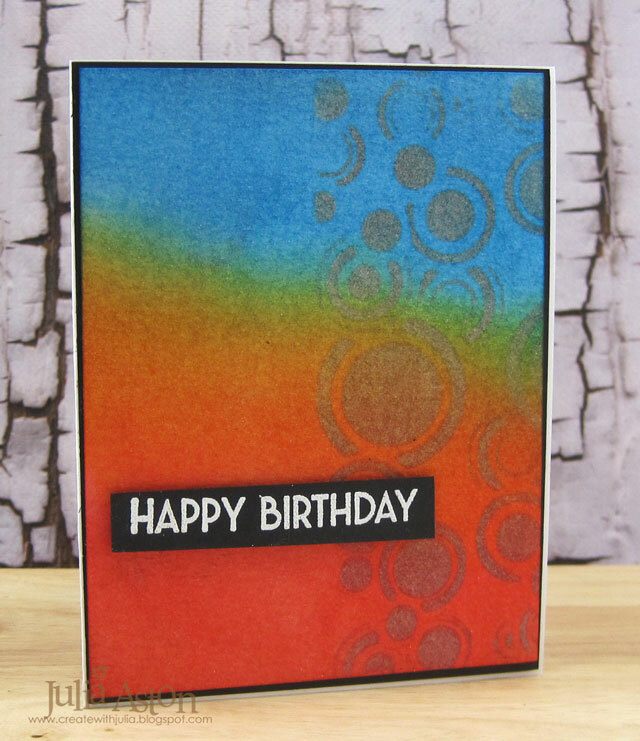 I love the gorgeous colors on these cards, and your stenciled circles add a fabulous touch. Thanks for joining us at Freshly Made Sketches this week!